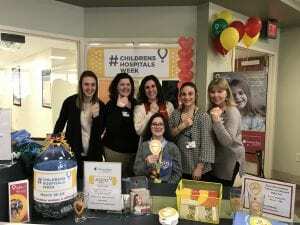 Did you know that we’ve been partners with Children’s Miracle Network Hospitals https://samaritanhealth.childrensmiraclenetworkhospitals.org/ since 1990? Because of the tremendous dedication and support of our employees, customers and YOU, we’ve been able to help sick and injured kids for nearly 30 years! To celebrate the amazing things being done and the hard work yet to come, we’re inviting you to join us March 18-24 in celebrating #ChildrensHospitalsWeek. Facebook: More than 10 million kids enter a @Children’s Miracle Network Hospitals each year for treatment. Join us March 5-11 in supporting their efforts to provide the best care available during #ChildrensHospitalsWeek. Learn more: cmnhospitals.org/childrenshospitalsweek. Twitter/Instagram: We’re excited to support #ChildrensHospitalsWeek and the 62 kids who enter a @CMNHospitals each minute. Will you join us? Create a Facebook Fundraiser. Show your social communities you support this important cause and help them get involved. Create a Facebook fundraiser. Go to Children’s Miracle Network of NNY and select “Create a Fundraiser”.